Now in its eighteenth season, the GRAMMY� Award-winning Brooklyn Youth Chorus (BYC) is one of the country�s leading children�s choruses and is the ensemble of choice for internationally renowned orchestras and artists. The Chorus has performed with renowned artists such as Elton John, Nico Muhly, Lou Reed and John Legend, and has performed under the batons of Marin Alsop, Robert Spano, Leon Botstein, and many others. In 2002, BYC debuted with the New York Philharmonic under Lorin Maazel in On the Transmigration of Souls, for which the Chorus won a GRAMMY� Award. 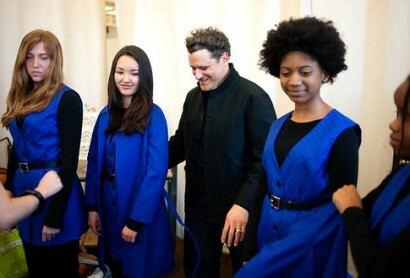 One of the world�s most celebrated youth choirs is now also the best-dressed, thanks to acclaimed fashion designer Isaac Mizrahi. The Grammy Award-winning Brooklyn Youth Chorus Academy, which has performed with the likes of Elton John, Lou Reed, and Sufjan Steven, premiered it new line of choir robes custom-designed by the Brooklyn-born fashion icon during a performance with Manchester Orchestra on Late Night with David Letterman on May 12th. “They had me at Brooklyn,” Mizrahi told the Daily News. Check out their performance on Letterman below.